I am joining Sally for Blue Monday. Oh yes i miss warm temperature wahh.. Happy blue Monday. Thanks for putting that tune in my head! It's a good one for the last day of January and I'll be humming it for a while! It looks like a heart shaped cloud but scattering already. Musical Snow Globe is my blue post this week. Hi, La! I'm taking your advice, and I'm going to do just that! I've always loved that song; today, I hummed along as I read the words. Yes, it is a glorious sunny winter day right now. A good song for a Monday morning. Hope the ice and snow misses you. I do love your sweet spirit and good outlook..
o.k. 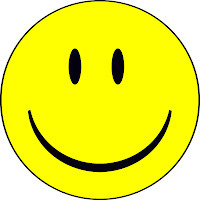 I put on a happy smile face, just for you! Most of us can relate to that tune. We could all have a smiling face if this weather would let up. Your blue sky shots is very pretty. Really we need this in the last months of winter.Thanks for the cheering song! Trying to smile but it is so hard when the ice is pouring down here. Ugh! Have a great week.